Art and Soul is all wrapped up and the winners have been announced. We are very pleased to tell you all that Samuel's sculptures did win, and his sculptures won TWO awards! Art Roamers accepted the first place in the judged 3-dimensional competition and the 4th place overall awards on Samuel's behalf. Due to timing and travel constraints, Samuel was not able to attend all the way from Africa. The pictures in this entry are from the award ceremony. The ceremony was held at the Orpheum Theatre on Main Avenue in Twin Falls, on Saturday afternoon. It's always nice when we have an excuse to go down Main since the construction has been completed. The beautiful weather was also a bonus. It was great to have the ceremony to attend as Art and Soul has come to a close. We enjoyed getting to see the artists and the awards being given out. We want to thank Art and Soul and the Magic Valley Arts Council for putting on this event and giving artists the opportunity to share their work. Also, thank you to the artists, venues, and sponsors. With your support and participation, this event gets better every year. We especially want to thank KMVT for being our venue. We hope you enjoyed having us as much as we enjoyed being there! Finally, thank you to all of the voters. We appreciate everyone that has any involvement in Art and Soul from the volunteers and participants to the viewers and voters. Congratulations to all of the participants. The full results can be found on the Art and Soul website, found here: http://magicvalleyhasart.com/. Be sure to comment with any questions and follow us on Facebook! For the last couple of months or so, we have been toying with the idea of getting a vehicle for our trips. 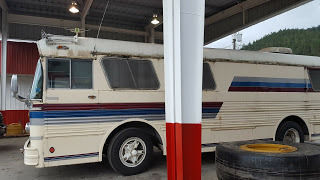 We weren't 100% sure if we wanted to find a vintage cab-over or a motor home to make road accommodations easier. After spending time browsing Craigslist, we would call to find out the vehicle had been sold. Or we would drive to look at it, to find that the condition of the vehicle didn't match the price. We finally found a possible prospect in northern Idaho. Susan and Jeff drove up to Hayden, which is just north of Coeur d'Alene last Tuesday. They were there to look at a 1962 GMC Private Coach. The seller hadn't used it in quite some time, it had been sitting in storage for ten years, and it would still run (bonus!). Before hitting the road, there were some items that needed to be taken care of right away. As you can imagine, having a bus sit for ten years, the tires weren't really road worthy any more. On Wednesday, we hit up Les Schwab, and they had three tires in stock. We waited another day for them to get the other three in. There were some electrical components that were a little less reliable than we would have liked, but some fuses and wiring would get that squared away. Chappie wriggled his way out of the back window of the truck, so we had the pleasure of chasing him down. The bus was also full of dead hornets. Those got vacuumed up before hitting the road too. That would have been way less fun if they had still been alive. Before we brought it home. On Thursday, we were on the road. We had to make a stop in Kellogg, at another Les Schwab, to have the tires tightened. For something like this, we definitely didn't want to take a chance having something go terribly wrong. Just down the highway, we stopped in Wallace when the electrical started to act up again. Without the gauges working, we would have been taking a bit risk of blowing the engine. After checking more fuses and wiring, we called it a night. Friday morning, we got up and hit the road again. Friday was much less eventful. We made a stop in Missoula to have the radiator blown out, and then were on our way again. We made our pit stops throughout the day without having any more real issues. The weather in Pocatello was terrible with thunderstorms, wind, pouring rain, and flash flood warnings, but we got through it. We were able to make it all the way home, which made for a very long day (about 13 hours). As you can imagine, when we pulled into the driveway, we were so relieved to be home. The icing on the cake was realizing the power at home was out. Here are some pictures of what the bus looks like now. We have found that it appears to be a custom build (as many motor homes this age would have been). The outside is in pretty decent shape, but the inside, while it isn't horrible, is very dated. There has been a little bit of leaking where the seals have given up. It has an air conditioner and a solar panel, but they may not be the most efficient models available any more. We are looking forward to making the inside more comfortable for us when we go on the road. A big patch of lichen growing on the roof. It's been a few weeks since the fun, multiple day journey from northern Idaho to home with our new-to-us vintage bus. If you missed the blog about that delightful trip, be sure to check out our blog archive! Also in that blog, there are pictures of the interior. As much as we love the outside of the bus, the inside reminds us a little too much of permanent waves, plastic covered couches, and bell bottoms (and not in a good way). We've been working on basically gutting the bus to remodel the interior. We've been removing parts of the inside, because we think a find like this bus deserves a second life. So far, we have removed the carpet, taken out the mattresses (Chappie doesn't get dibs any more), and the couch is out. We did find a little bit of rot behind the couch. While that is a bummer, we're still extremely pleased with the bus and its potential. Considering the other vintage vehicles we were looking at and the condition they were in, we still think we made the right choice. Chappie thought he had dibs on the beds, but now he's going to have to sleep on the floor! Since we are going to be taking this on the road and need to be able to transport our art, we need to be able to tow a trailer. We've taken off the bumper so we can add a trailer hitch. The bumper was also a bit crooked, but now it's looking better. So that we can be ready for the Reggae Festival next month, we are going to go with a receiver hitch. It's not quite as exciting as taking out the guts of the bus, but one of the nice things about older vehicles is that they are a bit more owner friendly than new vehicles.